Mike was born in Mutare, Zimbabwe on the 27th of October 1949. He grew up in Mutare, left school in 1966, went to agricultural college in 1967 and joined the army in 1970. He later joined the Zimbabwe Parks & Wildlife Authority in 1971. He worked in Buhera and Chisarira, becoming the head of the National Parks PAC (Problem Animal Control) unit. 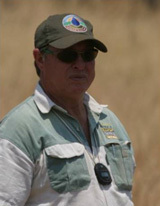 Mike then moved to Hwange National Park where he was Warden at Sinametella camp. During his time with Parks he also became well known for his involvement in Elephant culls. He later headed up one of the National Parks of Zimbabwe capture units. In 1981 he was stationed at Nyamanechi National Park as warden until he left Parks in 1989 to form his own private capture company. He has been capturing wildlife in Zimbabwe ever since. Mike was a co-founder together with Chris Brice of AWMC and they have since handed over the reins to Mike′s son NJ, and son-in-law Josh. 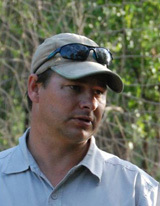 Mike now works on a consultancy basis with wildlife farmers and game parks and is also involved with a number of NGO′s on HWC (Human Wildlife Conflict) projects and PAC work. Although he is no longer part of the day to day running of AWMC, he is a company director and is still passionate about wildlife capture and remains very much a part of our team. Mike was married for 32 years until his wife, Cathy, passed away suddenly in 2006. They had 3 children together; N.J, Jacqueline and Deidre. Mike and his second wife, Trish, currently live in Harare. N.J was born in Harare, Zimbabwe on the 1st of July 1977. He grew up in the bush where his dad was stationed with National Parks in Hwange and Nyamanechi. When Mike left Parks to go private in 1989, they moved to a small farm about 30km north of Harare. N.J was involved with his dad′s capture team from a young age. After leaving school he became a tour guide in the north of Zimbabwe, but later left to pursue his dream of becoming a helicopter pilot. After training and working with his dad′s capture company for some years he went down to South Africa where he built flying hours and experience working with a number of capture teams there. In 2007 he returned to Zimbabwe full time to become more involved in the recently formed AWMC. He has been with the company ever since and is now one of the directors. N.J now has thousands of helicopter hours in game capture and is a valuable asset to the team. He married S.J (Sarah-Jane) in 2002, they currently stay in Harare. Jacque was born in Harare, Zimbabwe on the 19th of April 1979. Obviously, like her brother N.J, she grew up in the bush. When they moved to the farm outside Harare there were always injured or orphaned animals coming to the farm from various places. Jacque took a keen interest in them and whilst being involved in her parents′ capture team she took to raising and rehabilitating hundreds of animals over the years. She joined the ZNSPCA in 1997. 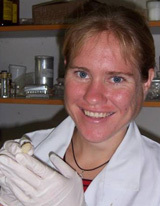 In 1999 she left Zimbabwe for Botswana to pursue her dream of becoming a vet. After working with the Botswana government for a number of years she moved to Tanzania where she was involved with the Frankfurt Zoological Society on the Black Rhino conservation project in the Ngorogoro Crater. Not long after that she was accepted into a University in Morogoro, Tanzania where she studied, sometimes under difficult circumstances, until qualifying as a Veterinarian in 2007. Upon completion of her degree, Jacque was offered a position with a wildlife NGO in Botswana. She worked there until marrying Josh in May 2008, and subsequently she moved back to Zimbabwe. She was involved with AWMC on a non-permanent basis until the end of 2009, when she became AWMC′s very own wildlife vet. She, her husband Josh, and daughter Shiyloh stay on the same farm her parents moved to in 1989, 30km outside Harare. Josh was born in Johannesburg, South Africa on the 17th of February 1980. His parents moved to the USA just after he was born, they were there for a number of years until they moved back to South Africa to the family farm in the Eastern Transvaal. Josh stayed on the farm with dreams of one day becoming a Game Ranger and Wildlife Conservationist. The family farm was sold in 2000 and Josh went into something very different for a number of years until, in early 2006 he decided to go touring the United Kingdom, where he met Mike La Grange. Josh got to know Mike during his time in England and learnt of his work in Zimbabwe. After spending a few months in the UK, Josh returned to Africa via Kenya, Tanzania (where he met Jacqueline), Zambia and finally Zimbabwe. Upon arriving in Zimbabwe in late 2006, he became passionately involved in the newly formed AWMC and has been with the company ever since. He is now one of the company′s directors. 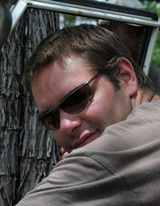 Although being mostly involved with AWMC he is also interested in Human Wildlife Conflict and Problem Animal Control and thus works on related projects with various NGO′s in Zimbabwe. Josh and Jacque married in 2008 and now live together with their daughter Shiyloh, on the farm outside Harare.